Helen Binkerd Young (1877 - 1959) graduated from Cornell University's architecture program in 1900. As a student, she won an architectural medal and wrote and published The Lincoln Hall Cookbook. 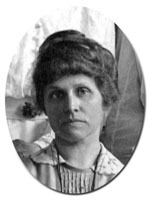 Unable to get a job teaching architecture, Young returned to Cornell in 1910 to teach household arts in the Department of Home Economics. The lack of teaching jobs available to women in architecture, coupled with the need for qualified faculty in a young department without much money for faculty salaries, explains in part why Young offered to teach in the Department of Home Economics for free. In her teaching, Young drew heavily on her training as an architect, encouraged the application of design principles to home planning and furnishing, and thus made a lasting impact on contemporary interior design. Young left the Department of Home Economics in 1921, but continued her work as an architect, designing homes both at Cornell and in Cayuga Heights through the 1920s.